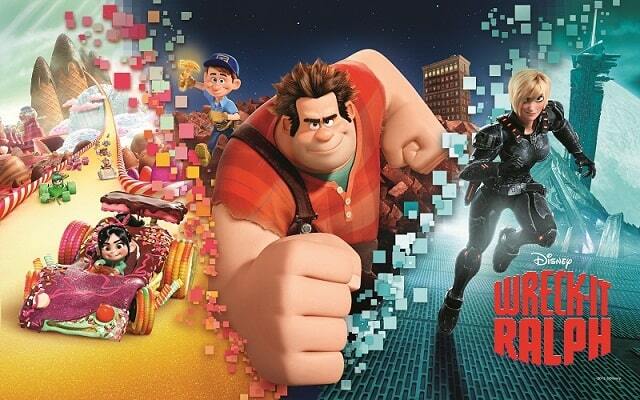 Wreck-It Ralph comes to theatres everywhere on November 2nd! I have been waiting for this movie to come to theatres ever since I first watched it at the #DisneyMoviesEvent at the end of September! My kids and John and are going to LOVE Wreck-It Ralph! I went into to screen Wreck-It Ralph unsure what to expect. I knew it was a movie about video games after seeing the previews and was curious to see how I would like it. After watching Wreck-It Ralph, all the bloggers (myself included) raved about how great it was! I think kids and adults alike will love this film. 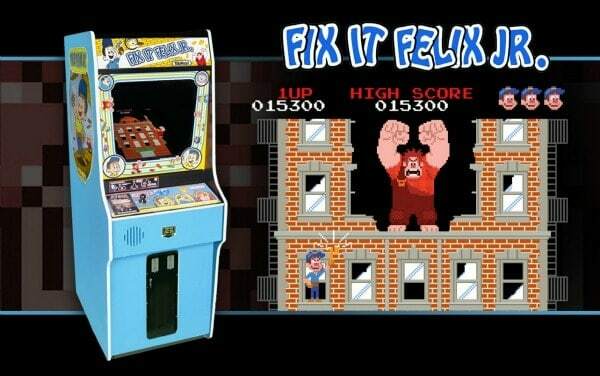 The main character is Wreck-It Ralph who is the villain in the Fix-It Felix, Jr. arcade game. Basically Felix fixes everything after Ralph destroys it and the process repeats. Wreck-It Ralph has an epiphany and realizes he doesn’t want to be feared and hated. I actually felt a bit sorry for Wreck-It Ralph especially when he saw that he wasn’t invited to a party that all the other characters in his game were having. He decides to crash the party and the characters were very fearful. It made me feel sorry for Ralph because he only wanted to fit in. Ralph ends up destroying the cake and breaking things at the party inadvertently. He’s just so big and powerful that he can’t help himself. Ralph escapes his game and the viewer gets to experience new video game worlds as we follow his journey. Hero’s Duty, is a shooter game, with more realistic game animation. It reminded me a little of John’s Call of Duty game. There he meets Sgt. Calhoun and helps her fight the alien invaders. My favourite world was Sugar Rush where everything is sweet enough to eat. The entire world is made of candy in bright, pretty colours. It looks good enough to eat! Sugar Rush is a car racing game where Ralph finds an ally and friend in Vanellope von Scheweetz. Vanellope is an outcast too in her game and has been told by the popular game characters that she is a “glitch”. For this reason, Vanellope can never leave Sugar Rush no matter how hard she tries. I grew up playing video games both at home and at the arcade at our local mall. Each world in Wreck-It Ralph was unique and reminded me of games I used to play especially Fix-It Felix, Jr. That particular world reminded me of Mario Bros. from the 80s when we first got a Nintendo. The world is very square and pixelated just like Mario Bros was. It made me feel a bit nostalgic for my childhood because I have such fond memories playing video games with my sisters and cousins. 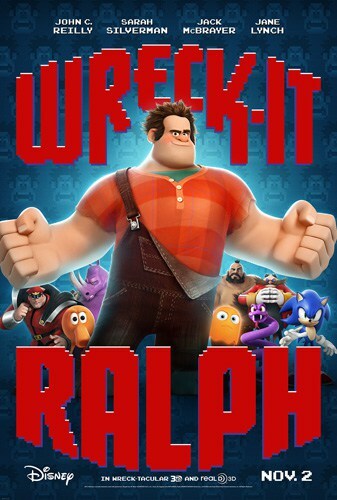 Wreck-It Ralph has all the right elements of a great movie. It’s funny, exciting, action-packed and perfect film for the family to watch and enjoy. Go see it on November 2nd!! I cant tell you how excited I am for this movie! Sometimes I feel like Disney is the only studio still thinking up good ideas for movies. Not that I am complaining because disney is awesome but still. Thanks for sharing you thoughts from the screening. I was unsure about it and glad to know you think the family would enjoy it. Stumbled! I wasn’t sure about this movie as I haven’t really seen any previews, but after reading this it sounds great. My son would love this movie. My grandson will love this. My children are asking to see this when it comes to Red Box (we don’t go to theaters) I wonder though if there are any cuss words or using of God’s name in vain or innuendos that seem to pervade children’s movies today – I didn’t see that when I read your review so curious about that. Awesome review! Can’t wait to watch it with my family! I thought the movie was awesome too, I agree with you about it’s going to be a great hit. I got the chance to see it last week at a preview. I also wrote about it on my blog too. I can’t wait to see this!! I’ll be taking the Grandkids this weekend for sure! I’m so excited to see this – my daughter hasn’t been to a movie in a theater yet (she’s almost 4) so I’m thinking of taking her as her first movie experience! I’ll be taking my son to see this one for sure! I think my nephew will really like this movie! My husband really wants to take the kids to this!